Prison Tycoon 4: SuperMax Game Review - Download and Play Free Version! Can you design and run a highly secure prison that controls the worst criminals? Prison system is represented as a rehabilitation center, not just a place where bad people go. Graphics are very realistic and lifelike. The game lacks a tutorial making it hard to start playing. It's difficult to know whether or not you are completing objectives or moving toward your goals because information is not clear or easily accessible. Controls are not easy to use and you are unable to 'zoom-in' unless it is to look into a building. Build a profitable prison from the ground up! In Prison Tycoon 4 - Super Max you are the warden and in complete control! You must design a modern prison that effectively manages society's criminal population. Every wall, every fence, & every decision is yours. Start small and forge your reputation as a first rate warden. Grow your facility to SuperMax capabilities, housing the most dangerous and diabolical criminals on earth - all for fame and great fortune. First you need to decide what buildings you will have and where to place them. Every choice effects the safety and respectability of your prison. Recreation, work, staff, dorms and other facilities need to be placed carefully. After you build you can enter the buildings and place furniture and other items. Staffing the prison security is also important. Don't pay your security force enough and morale and performance will go down. Pay them too much and you could go bankrupt. They will also have to manage riots and keep the prisoners from escaping. Manage the security levels throughout your prison. Too strong a grip can explode in prisoner riots - too weak and the gangs will run your stir. Lock up the worst of the worst in the NEW Restricted Access Quarters for 23 hours a day with 1 hour for outside exercise. Build prisoner factories to bring in some extra income to help keep the prisons finances healthy. Determine your prisoner's fate - release your prisoner on parole or keep them locked up for the safety of society (and your pocketbook). Keep the peace among the prison gangs or one may take over certain areas of the prison as their own. Prison Tycoon 4 gives you alot of options and if you have ever wondered what it is like to run a prison, give this one a try! 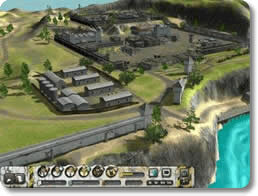 Prison Tycoon 4: Supermax is a sequel in the series of Prison Tycoon games. Like the previous versions, this game does not deviate from the objective of running and maintaining a successful prison. This game has it's positive qualities, but is packed with flaws that keep the good qualities at bay. In this game you are the warden of a maximum security prison and the well being of both the prisoners and the facility itself rests in your hands. 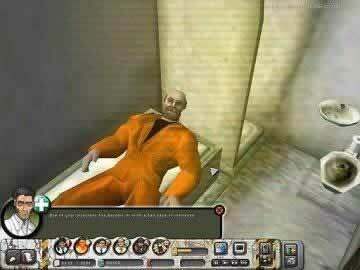 Unlike a lot of sequels, Prison Tycoon 4 is very similar to the original game. So similar, it's hard to find differences. The only obvious differences are the different levels and objectives, and the maximum security theme. These minimal differences can make this game feel more like an expansion pack rather than a new game. Like in the previous versions, Prison Tycoon 4 opens with two options of play. You can go to the free-play mode or you can take on the different scenarios. Once you've made your decision you are presented with a prison and it becomes your job to build facilities and increase the value of your jail. Government funding and random donations give you the start-up money you may need, allowing you to build dormitories, mess halls, factories, etc. These buildings and factories help you accomplish goals while simultaneously earning money for your prison. Factories for example, are your money making devices. In these you can have your prisoners make textiles or sort mail, adding to your revenue. Once your prison is set to your liking and your money-making factories are built, the game becomes frustrating. Since this prison simulation game is not equipped with a tutorial, running and making decisions about your prison is difficult and confusing, especially when the prisoners show up. Your employees will message you via text blurbs, giving you advice on what to do next. However, without the tutorial, figuring out how to execute their suggestions is really hard to do. One aspect of the game that exemplifies this difficulty is the gang element. Part of Prison Tycoon 4: Supermax is accounting for rival gangs and separating them whenever possible. Your expert staff will give you advice on how do keep the relationships healthy, but executing that advice is hard to do and difficult to figure out because it is never clearly explained. The lack of direction makes running a successful prison difficult if not impossible. Also, because there is no tutorial, figuring out the graphs and interpreting the data is tough. Numbers don't mean much without direction, so it's hard to know exactly how to interpret the data. On positive notes, the graphics and “message” of this game are great. Graphically the game is very clean and the prisoners look lifelike. The message of the game and the positive objectives for the prisoners is also a good element. Prison Tycoon 4: Supermax shows that prison is not just about containing people. It's about rehabilitation and helping people readjust to society. Through the positive objectives of rehabilitating people and keeping the conditions suitable for prisoners, this game offers real solutions to big problems. Overall, Prison Tycoon 4 is a game with potential that needs to be sat with and played for several hours. Not having a tutorial is a major drawback, but if you play around for some time you will certainly figure out the buttons and objectives. The game's keen graphics and interesting objectives make Prison Tycoon a game with vast fun potential, as long as you have the time and patience to figure it out and stick with it. Player created video showing some of the building layout and design aspects of Prison Tycoon 4.